The Merlo Group has the widest range of telescopic handlers on the market for the agricultural sector, testifying to our commitment to the continual development of new technologies and to the applications of our products. The compact telehandlers, successfully combining small dimensions, manageability, Iow running costs and performance at the top of its category. The Turbofarmer telehandlers, the first telescopic tractor in the world to be certified for hauling up to 20 tons on the road. The Multifarmer telehandlers, genuine tractors with a telescopic boom, a 3 point linkage and a mechanical PTO for carrying out all the work in the field and elsewhere, in complete safety, once again the first crossover in the world between tractor and telehandler. The Professional telehandlers, for those who need to work long hours with the telehandler. Continuous cycle work is no longer a problem! The High Capacity telehandlers, designed for all those who have to lift particularly heavy loads. 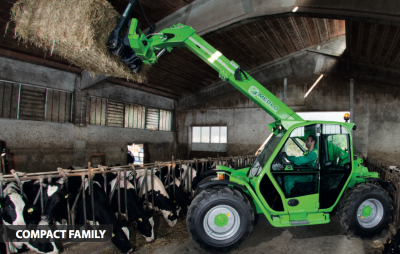 Merlo offers a wide range of machines for agriculturr incorporating unique technologies that only Merlo can offer and capable of saving you time, consuming less and working in total safety and comfort. The cab structure meets the international standards for FOPS and ROPS. Low Profile versions: cab height 1.77 m (P 25.6) and 2 m (P 28.8-P 32.6). Spacious driving position with plenty of room to move. 4.3m2 of window glass make manoeuvring easier and less stressful. Transparent cab roof for maximum visibility when lifting loads. Forward/reverse shuttle control on steering column(opt), fingertip operation allows the operator to keep both hands on the steering wheel for maximum safety. A full complement of carefully designed analogue and digital instruments. Soundproofing panels deaden engine noise for improved operator comfort. Air conditioning (opt): designed to create the ideal work climate. Door opens to 180° with independently opening side window.